My visit to Coorg or Madikeri - as the locals call it, is going to haunt me for a long time to come. It is also referred to as the "Scotland of India". Coorg is an endless expanse of scenic beauty - lush green valleys, coffee plantations, and majestic mountain ranges. Add to this the brave race of Kodavas - Field Marshal K M Cariappa was a Kodava. The Abbi Falls is situated very near to Madikeri city and the roar of the water can be heard from the main road from where a winding path goes through lovely coffee and cardamom plantations right up to falls. 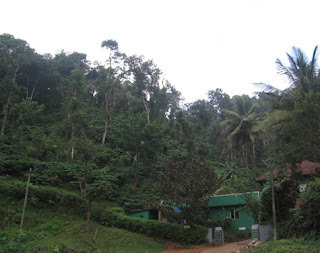 The Raja's Seat, according to legends, is the place where the kings of Kodagu spent their evenings at. Whether this is true or not, I do not know, but this place does offer a wonderful view of the valleys and mountains. Nisargadhama known for its calm and serene beauty, is a 2.5 sq. km. large island in the middle of the river Cauvery. Bhagamandala is the sacred site where the 3 rivers - Cauvery, the Kanika and the mythical river Sujyothi meet. The river Cauvery which is one of the 7 sacred rivers, originates at a place called Talacauvery in the Brahmagiri hills, at about 4,500 ft above sea level. This place is marked by a kundike from where the river emerges as a small perennial spring, but flows underground again to emerge a short distance away. From Talacauvery, steps (360 of them) lead up to the nearby Brahmagiri peak. From the peak, as well as on the drive to Talacauvery, we enjoyed a good view of the misty blue Brahmagiri hills. The visit to Bylekuppe, where the Namdroling Monastery is situated, was like a visit to a mini Tibet. The Tibetans were offered land by the Government of Karnataka when they sought refuge in India. They have created a wonderful place for themselves here. All around us we could see burgundy robed monks with shy and sometimes aloof faces. The Monastery is spread over a huge area and there were large gold statues of Buddha. The monks were chanting and the pipes and drums being played in their prayer rooms. Apart from all this, just walking down the winding hill roads and going for long drive on bike was what I enjoyed at Madikeri.